Happy Valentine’s Day! We have a contest! Valentine’s Day Contest at Orthodontics at Don Mills! 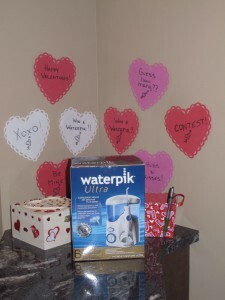 Pop by our office to enter our Valentines contest – guess the number of hearts and the closest wins a waterpik! Wishing all our patients and their families a Happy Valentine’s Day and sending you all a lot of LOVE from the team at Orthodontics at Don Mills! Orthodontist Dr. James Noble and Dr. Sandra Cassolato are located in Toronto ON (Ontario) M4A 2V6 – braces, clear braces, invisible lingual braces and Invisalign for children, teens, and adult orthodontics at Orthodontics at Don Mills. Offering affordable orthodontic care in Toronto ON, Scarborough ON, Don Mills ON, Willowdale ON, Leaside ON, Lawrence Park ON, Markham ON, Wexford ON, East York ON, North York ON, and The Beaches ON Canada.